PLATZ proteins are a novel class of plant-specific zinc-dependent DNA-binding proteins that are classified as transcription factors (TFs). However, their common biochemical features and functions are poorly understood. Here, we identified and cloned 17 PLATZ genes in the maize (Zea mays) genome. All ZmPLATZs were located in nuclei, consistent with their predicted role as TFs. However, none of ZmPLATZs was found to have intrinsic activation properties in yeast. Our recent work shows that FL3 (ZmPLATZ12) interacts with RPC53 and TFC1, two critical factors in the RNA polymerase III (RNAPIII) transcription complex. Using the yeast two-hybrid assay, we determined that seven other PLATZs interacted with both RPC53 and TFC1, whereas three had no protein-protein interaction with these two factors. The other six PLATZs interacted with either RPC53 or TFC1. These findings indicate that ZmPLATZ proteins are generally involved in the modulation of RNAPIII-mediated small non-coding RNA transcription. We also identified all of the PLATZ members in rice (Oryza sativa) and Arabidopsis thaliana and constructed a Maximum likelihood phylogenetic tree for ZmPLATZs. The resulting tree included 44 members and 5 subfamilies. This study provides insight into understanding of the phylogenetic relationship, protein structure, expression pattern and cellular localization of PLATZs in maize. 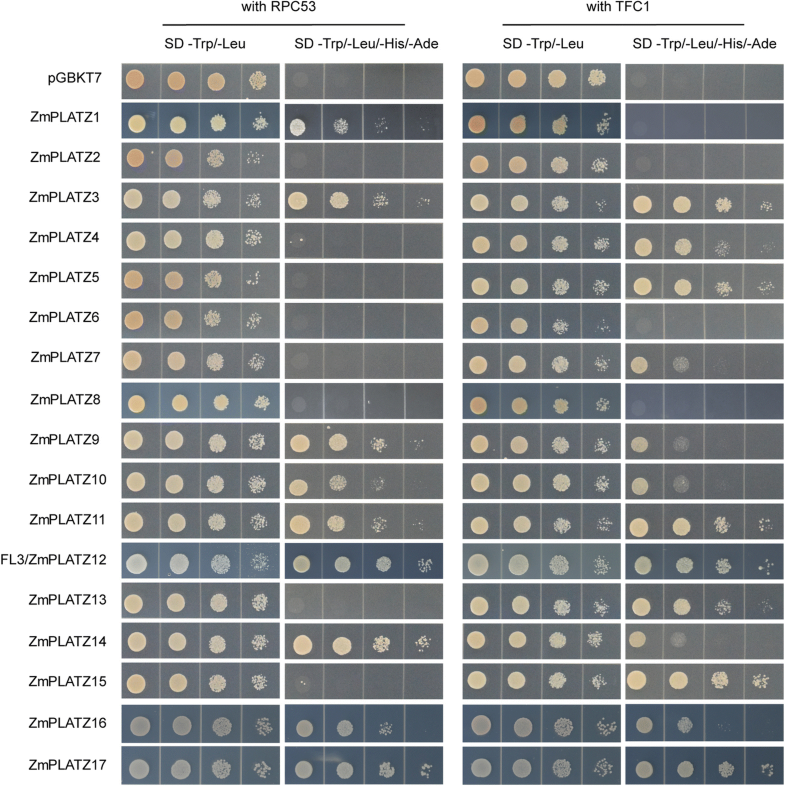 We identified nine and thirteen ZmPLATZs that have protein-protein interaction with RPC53 and TFC1 in the current study, respectively. Overall, the characterization and functional analysis of the PLATZ family in maize will pave the way to understanding RNAPIII-mediated regulation in plant development. In plants, 84 putatively TF families and other transcriptional regulators (TRs) have been identified from 19 species whose genomes have been completely sequenced and annotated (Plant Transcription Factor Database, PlantTFDB3.0) . TFs are proteins that bind to cis-elements in their target promoters in a sequence-specific manner, whereas TRs exert their regulatory function through protein–protein interactions or chromatin remodelling . Plants and animals or yeast do not show a good corresponding relationship in the evolution of the TF families. Approximately 50% of TFs in Arabidopsis and 45% in maize are plant-specific, indicating that these TFs play important roles in processes specific to plants, including secondary metabolism, responses to plant hormones, and the identity of specific cell types [3, 4]. Additionally, several TF families such as MYB superfamily, bHLH, and bZIP are large families in plants [5–7], but their numbers are remarkably fewer in animals and yeast [8, 9]. 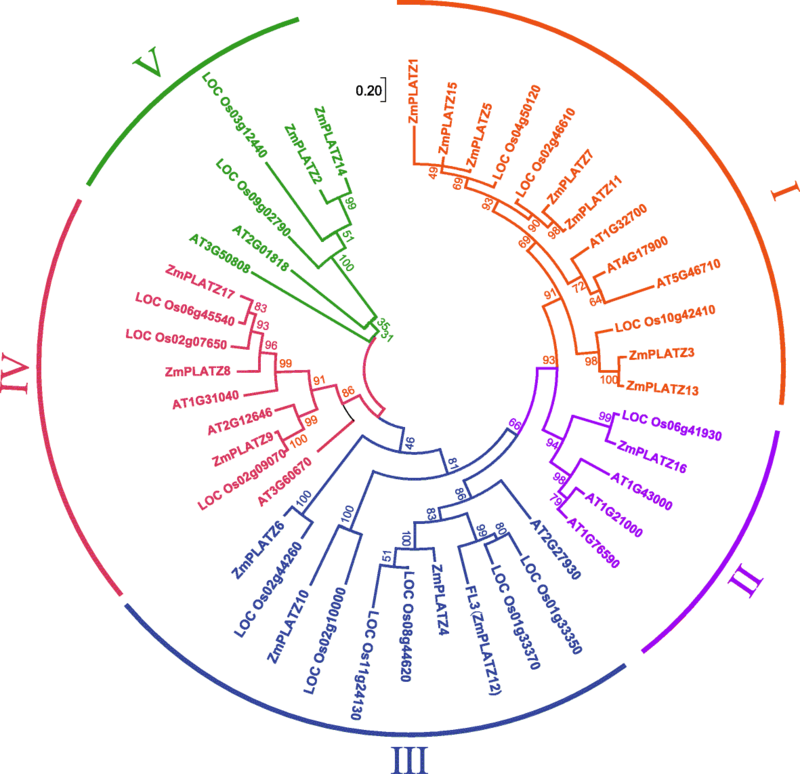 The PLATZ TF family is a novel class of plant-specific zinc-dependent DNA-binding proteins. The first reported member was PLATZ1, which was isolated from pea (Pisum sativum)  and shown to bind nonspecifically to A/T-rich sequences and repress transcription. However, the mutants and biological functions of any member in this family were not identified until the maize Fl3 gene was cloned from a classic endosperm semi-dominant mutant. Fl3 encodes a PLATZ protein that interacts with the RNAPIII subunits RPC53 and TFC1 through which it regulates the transcription of many transfer RNAs (tRNAs) and 5S ribosomal RNA (5S rRNA), and as a consequence, maize endosperm development and filling . RNAPIII is the largest enzyme complex among RNA polymerases, which is composed of 17 subunits and is responsible for the synthesis of a range of short noncoding RNAs (ncRNAs), including 5S rRNA, U6 small nuclear RNA (U6 snRNA), and different tRNAs, many of which have functions related to ribosome and protein synthesis [12, 13]. The high energetic cost of synthesizing these ncRNAs by RNAPIII is thought to underlie an accurate and coordinated regulation to balance cell survival and reproduction. In yeast, the RNAPIII transcription complex requires three transcription factors in addition to Pol III: two general transcription factors, TFIIIB and TFIIIC, and a specific transcription factor, TFIIIA, which is only required for the synthesis of 5S rRNA . Maf1 is a master regulator in the RNAPIII transcription system in yeast, which is essential for modulating transcription under changing nutritional, environmental and cellular stress conditions [15, 16]. Nhp6 is another small but powerful effector of chromatin structure in yeast, with a function involved in promoting RNAPIII transcription at a high temperature . Despite these findings in yeast, the components and mechanisms that modulate RNAPIII transcription in plants are little understood. CsMAF1 from Citrus sinensis was the first characterized RNAPIII-interacting protein in plants, which can interact with the human RNAPIII and repress tRNAHis synthesis in yeast [18, 19], indicating that the functions of MAF1 proteins are evolutionally conserved across different kingdoms. Another example is UBL1, a putative RNA exonuclease belonging to the 2H phosphodiesterase superfamily, which possesses RNA exonuclease activity in vitro and is involved in biogenesis of snRNA U6. The structure and function of UBL1 is conserved in plants, human and yeast, although the plant UBL1 is only 25.8% and 20.6% identical to its human and yeast counterpart, respectively . Grain filling in maize and other grasses is a high energy-cost process for the synthesis and accumulation of starch and storage proteins, which require an accurate and coordinated regulation of ribosome and protein synthesis. FL3 (ZmPLATZ12) is specifically expressed in maize endosperm starchy cells and functions as a modulator of the RNAPIII transcription complex consistent with the highly abundant synthesis of tRNAs and 5S rRNA in the maize endosperm. Genome-wide identification and characterization of PLATZs and analysis of their interaction with RNAPIII in maize will provide an avenue for understanding the common and specific features of each PLATZ member in plant development. The maize inbred line A619 seeds were originally obtained from the Maize Genetics Cooperation Stock Center (accession number 3405–001) and planted at our institute farm in Shanghai in the summer of 2017. Tobacco (Nicotiana benthamiana) plants were grown in a growth chamber under a day/night regime of 16/8 h at a temperature of 20–25 °C. First, the maize PLATZ proteins were used to search against the PlantTFDB (http://plntfdb.bio.uni-potsdam.de/) and GrassTFDB (http://www.grassius.org/grasstfdb.php) databases. Second, the FL3 (ZmPLATZ12) protein sequence was used as a query to search against National Center for Biotechnology Information (NCBI) using the BLASTP program in the maize B73 genome version 4 (E-value ≤ e-05). The unique sequences from the three databases were used for this study. Third, the FL3 (ZmPLATZ12) protein sequence was used as a query to search against NCBI using the BLASTP program in Oryza sativa (japonica cultivar-group, taxid: 39947) (E-value ≤8e-18) and Arabidopsis thaliana (taxid: 3702) (E-value ≤2e-05) reference protein databases. Fourth, the identified rice and Arabidopsis PLATZ proteins (OsPLATZs and AtPLATZs, respectively) from the above were used to search against the PlantTFDB database. The unique sequences from the two databases were used for this study. Tissues (root, stem, the third leaf and SAM) were collected from at least three healthy plants at 32 days after sowing. The tassel 1, tassel 5 and ear were sampled as described previously . Developing kernels were harvested at 1, 3, 6, 8, 10, 12, 14, 18, 24, and 30 days after pollination. Total RNA from fresh tissues was extracted using TRIzol reagent (Invitrogen, USA) and then purified with an RNeasy Mini Kit (Qiagen, Germany). The first-strand cDNAs were synthesized using SuperScript III reverse transcriptase (Invitrogen, USA) following manual instructions. The full open-reading frame of each ZmPLATZ gene was amplified with a specific primer pair. All primers used for RT-PCR are listed in Additional file 1: Table S1. The maize GRMZM2G105019 was used as the reference . Fifteen ZmPLATZ cDNAs were amplified from the leaf, stem, tassel, endosperm or embryo tissue, with the exceptions ZmPLATZ1 and ZmPLATZ8. The coding sequences of PLATZ1 and 8 were synthesized at Sangon Biotech (Shanghai, China) Co., Ltd., based on the gene annotation. Expression patterns of fifteen maize PLATZ genes were summarized based on the maize reference genome B73 (Additional file 2: File S1) . Hierarchical clustering of fifteen genes and heat map of 53 different seed samples were carried out by using normalized gene expression values with log2 (RPKM + 1) in R package ‘pheatmap’. Fifty-three samples represent different tissues and different developmental stages of the whole seed, endosperm and embryo.The sample IDs were used as previously described . The amino acid sequences translated from the ZmPLATZ CDSs were used to predict conserved domains using the Pfam database of Hidden Markov Model with an i-value threshold at 1.0 (http://pfam.sanger.ac.uk/search)  and SMART database of default parameters (http://smart.embl-heidelberg.de/) . The complete amino acid sequences of ZmPLATZs, were submitted to the Clustal W program using the default settings (pairwise alignment options: gap opening penalty 10, gap extension penalty 0.1; multiple alignment options: gap opening penalty 10, gap extension penalty 0.2, gap distance 4, no end gaps and protein weight matrix using Gonnet) for for multiple protein alignment. Based on the aligned protein sequences, the ZmPLATZ phylogenetic tree was constructed using the MEGA7.0 program (http://www.megasoftware.net/) and the maximum likelihood method with Jones-Taylor-Thornton (JTT) Model, and the bootstrap test was conducted with 1000 replicates. The amino acid sequences of ZmPLATZs, OsPLATZs and AtPLATZs were submitted to the Clustal W program using the default settings for multiple protein alignment. Based on the aligned protein sequences, sequences with > 30% gap was removed. Then, a maximum likelihood tree about ZmPLATZs, OsPLATZs and AtPLATZs was constructed using the default settings based on Jones-Taylor-Thornton (JTT) Model with partial deletion and 70% Site Coverage Cut off, and the bootstrap test was conducted with 1000 replicates. The amino acid sequences translated from the ZmPLATZ CDSs were used to predict nuclear localization signal (NLS) using the wolf-psort (https://psort.hgc.jp/) or PredictNLS (https://rostlab.org/owiki/index.php/ PredictNLS) online tool. The C-terminal of each ZmPLATZ CDS was fused to a reporter gene encoding the enhanced GFP (eGFP), which was then cloned into pCAMBIA1301 plasmid driven by the 35S promoter. Agrobacterium tumefaciens (strain GV3101) harbouring this construct was infiltrated into 3-week-old N. benthamiana leaves using a needle-less syringe. At least three replicates were performed. The eGFP signal was observed and imaged using a confocal microscope (FV1000, Olympus, Japan). Full-length coding sequences of PLATZs were cloned into the pGBKT7 plasmid (BD) and transformed into yeast strain Y2HGold to test for auto-activation. Yeast on SD/−Trp agar plates were grown at 28 °C for 2 days and on SD/−Trp -Ade -His for 3 days. For the protein-protein interaction assay, TFC1 and RPC53 were ligated to the pGADT7 plasmid (AD). pGADT7-TFC1 or pGADT7-RPC53 with pGBKT7-PLATZs were co-transformed into Y2HGold. The yeast cells were plated on SD/−Trp -Leu at 28 °C for 2 days and on SD/−Trp -Leu -Ade -His for 3 days. To characterize the number of members in this new family, we searched the maize PLATZ proteins in the PlantTFDB and GrassTFDB databases, which were both based on the B73 genome version 3. This search resulted in the identification of 21 and 15 members from the two databases. Although 26 completely unique protein sequences were characterized, only 15 PLATZs were confirmed as expressed genes by the public maize RNA-seq data . Because the B73 genome version 4 is available now , BLASTP searches were performed using the FL3 (ZmPLATZ12) protein sequence with E-value ≤ e-05. Fourteen ZmPLATZs from version 3 were re-identified in the version 4 genome, with PLATZ2 exception, whereas two new PLATZ genes (Zm00001d046688 and Zm00001d046958) missing in version 3 were annotated in version 4. Collectively, 17 ZmPLATZ members including the previously reported FL3 (ZmPLATZ12)  were analysed in the current study (Table 1). The protein nomenclature was in accordance with that of the GrassTFDB ID (ZmPLATZ1–15), and the two new PLATZs annotated from version 4 were designated ZmPLATZ16 and ZmPLATZ17 (Table 1). The 17 ZmPLATZ genes are unevenly distributed on 7 chromosomes, with chromosomes 1, 5 and 9 each bearing 4 members. RT-PCR was employed to amplify the intact CDS of each ZmPLATZ gene. PLATZ2, 5, 7, 11, 12, and 13 were cloned from the 12-DAP endosperm, and PLATZ3, 16, and 17 were cloned from the root. PLATZ4, 6, 9, 10, 11, 14, and 15 were cloned from the 18-DAP endosperm, tassel, 20-DAP embryo, 6-DAP endosperm, 12-DAP endosperm, 3-DAP seed, and 36-DAP endosperm, respectively. The expression of PLATZ1 and 8 was not detected in any tissue used in this study. (Additional file 2: File S1). The cDNA sequences of ZmPLATZ2, ZmPLATZ3, ZmPLATZ5, ZmPLATZ7, ZmPLATZ10, ZmPLATZ13 and ZmPLATZ15 were identical to the predicted CDSs from the B73 genome version 3, whereas those of ZmPLATZ4, ZmPLATZ9, ZmPLATZ11 and ZmPLATZ14 had several mismatches compared with the predicted CDSs (Additional file 3: Figure S1). The version 3 predicted ZmPLATZ6 CDS was different from that of version 4 at the C-terminal. We sequenced the amplified ZmPLATZ6 cDNA, which was nearly identical to the version 4 CDS except for 9 SNPs (Additional file 4: Figure S2). The cloned cDNA sequences of ZmPLATZ16 and ZmPLATZ17 were the same as the predicted CDSs of version 4 except for a 3-bp insertion in the ZmPLATZ17 cDNA. PLATZ proteins were classified as TFs containing a conserved PLATZ domain, although the components of other domains have not been recognized. The protein sequences of 15 cloned and 2 predicted (ZmPLATZ1 and ZmPLATZ8) ZmPLATZ genes were subject to conserved domains prediction using the Pfam  and SMART  databases. It was predicted that all ZmPLATZ members contained a PLATZ domain (Pfam family PLATZ: PF04640, http://pfam.xfam.org/family/PLATZ). Additionally, many members were predicted to bear a BBOX(B-Box-type zinc finger, SMART accession number: SM00336, http://smart.embl-heidelberg.de/smart/do_annotation.pl?ACC=SM000336&BLAST=DUMMY)domain, which is located before the PLATZ domain. 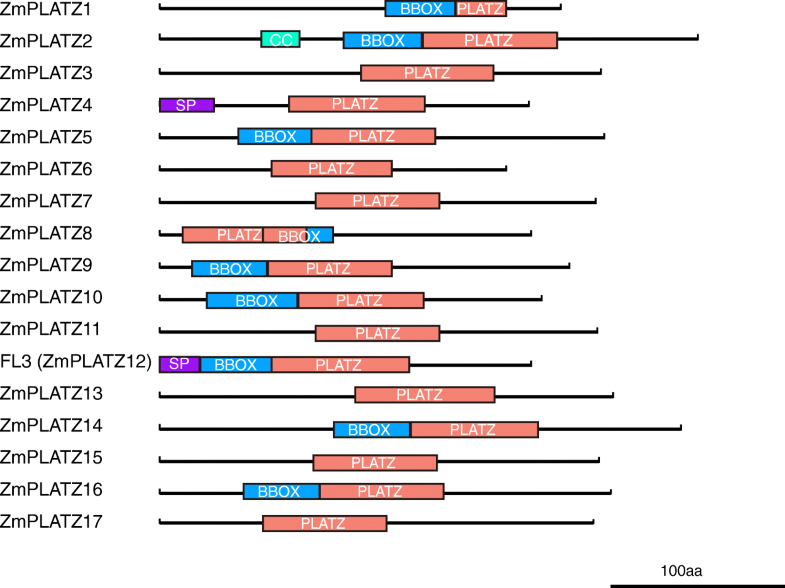 The PLATZ domain is highly conserved between ZmPLATZs which could be identified though all the database and the BBOX domain is not very conserved with highly E-value. ZmPLATZ8 was an exception, with the BBOX positioned in the rear of the PLATZ domain with an overlap (Fig. 1, Table 2 and Additional file 5: File S2). Only ZmPLATZ2 has a CC (coiled coil) domain, and ZmPLATZ4 and ZmPLATZ12 have a signal peptide domain. To characterize the phylogenetic relationships among ZmPLATZ proteins, we constructed a phylogenetic tree of the 17 ZmPLATZs (15 cloned and 2 predicted (ZmPLATZ1 and ZmPLATZ8)) using Clustal W and MEGA 7.0. The maximum likelihood method was used to construct the phylogenetic tree (Fig. 2 and Additional file 6: Figure S3). The ZmPLATZs were grouped into three branches. Clade 1 contained ZmPLATZ5, ZmPLATZ15, ZmPLATZ1, ZmPLATZ7, ZmPLATZ11, ZmPLATZ3, andZmPLATZ13. Clade 1 ZmPLATZ members contained a conserved domain (MAID-x4–8-L-x4-R-x4–5-GGG) in N-terminal (Additional file 6: Figure S3). Clade 2 contained ZmPLATZ16, ZmPLATZ4, ZmPLATZ12, and ZmPLATZ10. Clade 3 contained ZmPLATZ6, ZmPLATZ2, ZmPLATZ14, ZmPLATZ9, ZmPLATZ8, and ZmPLATZ17. The temporal and spatial expression patterns of the PLATZ genes in maize were investigated by analysing the transcripts using the public RNA-seq data  (Fig. 3) and RT-PCR (Fig. 4). Three PLATZs, namely 11, 7 and 15, were exhibited high and ubiquitous expression in all tissues except the developing endosperm. PLATZ5 was expressed at varying levels in all tested tissues as shown by RT-PCR. but not in the public RNA-seq data. PLATZ3 and PLATZ13 exhibited similar expression patterns in root, stem, leaf, SAM and early seed, but PLATZ3 had a higher expression level. The PLATZ6 gene was specifically expressed in tassel, indicating that the function of this gene is involved in tassel development, The PLATZ9 transcripts were only detected in root and stem. Transcript levels of PLATZ4 were much higher in the developing endosperm than those in other tissues. However, PLATZ4 was more ubiquitously expressed than Fl3 (PLATZ12) which expression was only detected at a high level in endosperm and at a weak level in the embryo (Fig. 4). Two other PLATZs, 2 and 14, were expressed between 8 and 10 DAP in the endosperm, coincident with initiation of the endosperm filling. PLATZ10 was weakly but specifically expressed in endosperm at 8 DAP. These four PLATZs might all be involved in maize endosperm development and storage reserve synthesis. We failed to clone ZmPLATZ1 and ZmPLATZ8 cDNAs from any tissue, most likely because they are only expressed in a highly differentiated tissue that was not investigated in the current study or under a special condition. According to their expression levels and patterns , maize PLATZ genes could be clustered into two categories and Fl3 (PLATZ12) appeared as an out-group branch for its highest and specific expression in endosperm. The first category was composed of five genes (PLATZ4, PLATZ5, PLATZ11, PLATZ7 and PLATZ15) with high and more ubiquitous expression levels, suggesting comprehensive roles in plant growth and development. The second category included other PLATZs of which the expression levels were relatively low and specific. ZmPLATZ16 and ZmPLATZ17 have not been included in either of the two clusters due to being missing in the B73 genome version 3. The nuclear localization signal (NLS) could be predicted using wolf-psort (https://psort.hgc.jp/) or PredictNLS (https://rostlab.org/owiki/index.php/PredictNLS). A NLS was not identified in the FL3 (ZmPLATZ12) protein by online software, although the FL3-GFP fused protein is localized in nuclei . To determine the subcellular localization of other members, each PLATZ protein was fused to green fluorescent protein (GFP). Because of the failure to amplify ZmPLATZ1 and ZmPLATZ8 cDNAs in any investigated tissue, their coding sequences were artificially synthesized (See methods). The free GFP was used as the control. The constitutive 35S promoter drove all gene cassettes. We transiently expressed the resulting constructs in tobacco leaves. 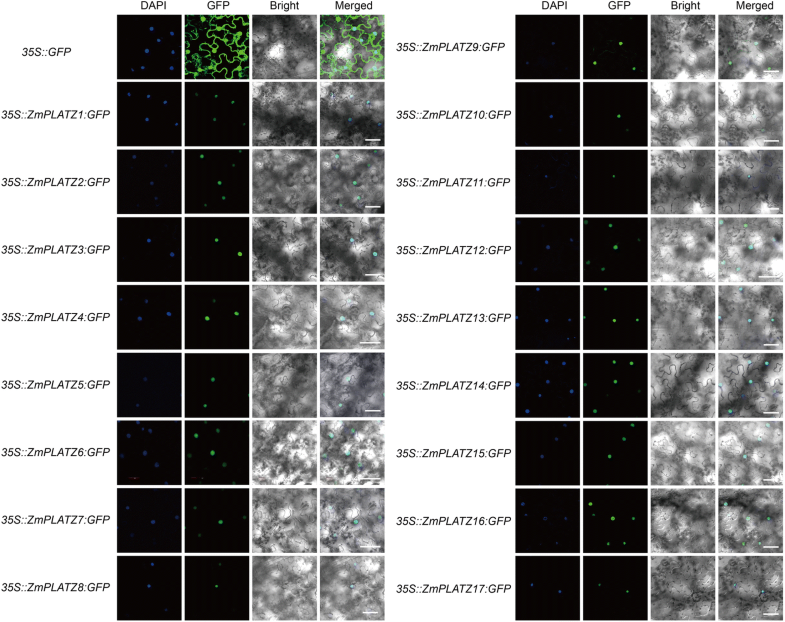 All signals of the fused proteins including those of 35S::PLATZ1:GFP and 35S::PLATZ8:GFP were localized in nuclei, consistent with their predicted function as TFs, whereas the control 35S:GFP was detected both in nuclei and the cytoplasm (Fig. 5). Previously, FL3 (ZmPLATZ12) was shown to have protein-protein interaction with RNAPIII subunits RPC53 and TFC1, but this protein was not found to have no intrinsic activation properties by using the yeast transactivation assay . We then investigate other fused BD-ZmPLATZ proteins whether they were able bind to GAL4 upstream activating sequences (GALUAS) and activate transcription of the lacZ reporter gene. In contrast to the Opaque 2 (O2) control, an endosperm-specific bZIP TF for regulation of the storage-protein zein gene expression, none of PLATZs showed intrinsic activation properties (Fig. 6). Therefore, ZmPLATZs could be used to verify protein-protein interaction with yeast two-hybrid. We also tested whether other PLATZs could interact with RPC53 and TFC1. ZmPLATZ1 only interacted with RPC53, and ZmPLATZ4, ZmPLATZ5, ZmPLATZ7, ZmPLATZ13 and ZmPLATZ15 only interacted with TFC1. Similar to FL3 (ZmPLATZ12), ZmPLATZ3, ZmPLATZ9, ZmPLATZ10, ZmPLATZ11, ZmPLATZ14, ZmPLATZ16 and ZmPLATZ17 interacted with both. However, PLATZ2, PLATZ6 and PLATZ8 did not have a protein-protein interaction with RPC53 or TFC1 (Fig. 7). Collectively, these results indicate that PLATZ proteins are generally involved in modulation of RNAPIII-mediated transcription in different tissues. We identified 17 ZmPLATZs from the maize genome. To explore the evolutionary conservation of PLATZ proteins in other species, we used the FL3 (ZmPLATZ12) protein sequence to blast against the rice (japonica cultivar-group, taxid: 39947, E-value ≤8e-18) and Arabidopsis thaliana (taxid: 3702, E-value ≤2e-05) reference protein databases. A total of 15 and 12 unique protein sequences were identified in rice and Arabidopsis databases, respectively (Additional file 7: File S3). 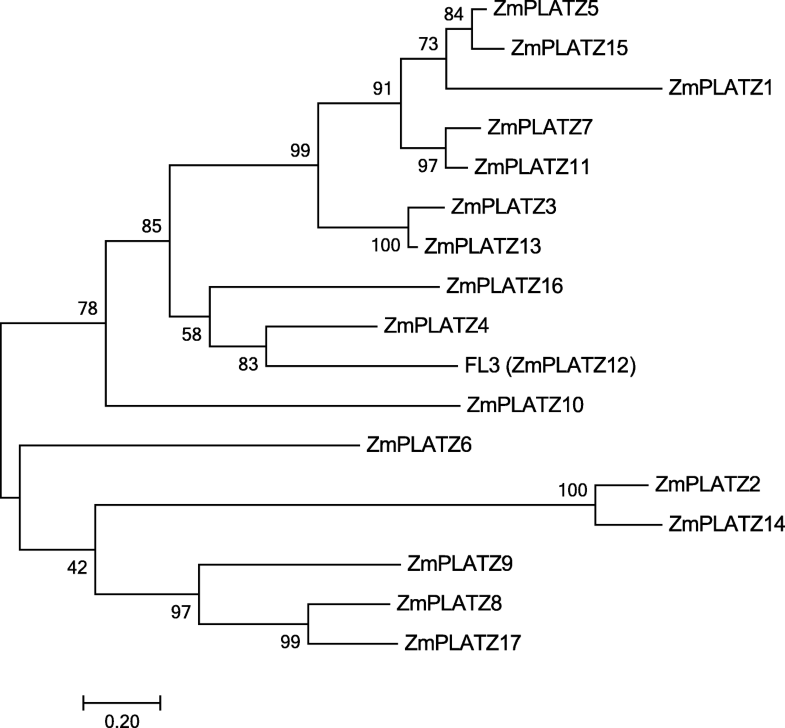 To investigate the phylogenetic relationships among PLATZ proteins, we constructed a phylogenetic tree of the 17 ZmPLATZs, 15 OsPLATZs and 12 AtPLATZs. The maximum likelihood method was used to construct the phylogenetic tree using Clustal W and MEGA 7.0 (Fig. 8 and Additional file 8: Figure S4). We divided the 44 PLATZ proteins into 5 subfamilies, designated I, II, III, IV and V based on the primary amino acid sequence. We noted that each subfamily included maize, rice and Arabidopsis members. Subfamily I was corresponding to clade1 of the phylogenetic tree of ZmPLATZs and contained a conserve domain (MAID-x4–8-L-x4-R-x4–5-GGG) in N-terminal (Additional file 8: Figure S4). Some ZmPLATZ members had OsPLATZ homologues with high bootstrap support (> 90%), such as ZmPLATZ9 and LOC Os02g09070, ZmPLATZ16 and LOC Os06g41930, and ZmPLATZ6 and LOC Os02g44260, indicating that these members are evolutionarily conserved in the grass family. Some ZmPLATZ members had two OsPLATZ homologues, such as LOC Os01g33350 and LOC Os01g33370 with ZmPLATZ12 and LOC Os08g44620 and LOC Os11g24130 with ZmPLATZ4. The close genome locations and similar expression patterns of LOC Os01g33350 and LOC Os01g33370 (http://rice.plantbiology.msu.edu/cgi-bin/ORF_infopage.cgi) indicated the two OsPLATZ genes resulted from gene duplication after the split with speciation of maize and rice. In a genome-wide screen of PLATZ proteins in the maize B73 genome version 3 and 4, we identified 17 complete members that all harboured the conserved PLATZ domain. Among the members, the expression of 15 ZmPLATZs was confirmed in variant tissues. The coding sequences of ZmPLATZ1 and ZmPLATZ8 were artificially synthesized for the following research. All ZmPLATZ proteins located to nuclei. Based on the random binding site selection (RBSS) experiment, A/T-rich sequences were recognized by FL3 (ZmPLATZ12). All members, except for ZmPLATZ2, ZmPLATZ6 and ZmPLATZ8, had a protein-protein interaction with either RPC53 or TFC1 or both (Fig. 7). This finding indicates that ZmPLATZ proteins are generally involved in modulation of RNAPIII transcription. Although the gain-of-function mutant fl3 shows severe defects in endosperm development and storage reserve filling, the knockout and knockdown mutations of this gene do not cause an apparent floury phenotype . In addition to FL3 (ZmPLATZ12), ZmPLATZ2, ZmPLATZ4, ZmPLATZ10 and ZmPLATZ14 were also expressed in the developing endosperm (Fig. 4). ZmPLATZ4 interacted with TFC1, and ZmPLATZ10/14 interacted with RPC53 and TFC1. One could envision that the three RNAPIII-interacting ZmPLATZs have redundant function with FL3 in the maize endosperm. Thus, creation of a series of double, triple and quadruple mutants of ZmPLATZ4, ZmPLATZ10, Fl3 (ZmPLATZ12) and ZmPLATZ14 will be an effective approach to overcome the functional redundancy. A comparable number of PLATZ genes were identified in rice (15) and Arabidopsis (12), although the maize genome size (2300 Mb)  is ~ 5.3- and ~ 18.4-fold larger than that of rice (430 Mb)  and Arabidopsis (125 Mb) . This huge discrepancy could be explained by a much higher percentage of transposons in the maize genome. The number of PLATZ genes is apparently conserved across different plant genomes. The phylogenetic comparison of the PLATZ proteins was conducted in maize, rice and Arabidopsis, and their evolutionary relationships within and among the different species were investigated for the first time. Because of low identity between ZmPLATZs and AtPLATZs (the lowest at only 27%), the bootstrap values of some outer nodes were low; nevertheless, the internal nodes had more credible bootstrap values. The 44 PLATZ members from maize, rice and Arabidopsis were divided into 5 subfamilies (Fig. 8). The ML phylogenetic tree constructed by the 17 ZmPLATZ proteins could be divided into three branches (Fig. 2). Subfamily I of the total ML tree corresponding to clade1 of the phylogenetic tree of ZmPLATZs, contained a conserved domain (MAID-x4–8-L-x4-R-x4–5-GGG) in N-terminal. Meanwhile, the internal nodes between the two trees were comparable. For example, the branch of ZmPLATZ12 (FL3) and ZmPLATZ4 in the maize ML tree was also included in subfamily III in the total ML tree, and the branch of ZmPLATZ2 and ZmPLATZ14 in the maize ML tree was included in subfamily V in the total ML tree. Moreover, the subfamily III included LOC Os01g33350, LOC Os01g33370 and ZmPLATZ12, which display a similar expression pattern during rice and maize endosperm development, indicating a conserved function of the three orthologous PLATZ members in grass. In conclusion, we identified and cloned 17 PLATZ genes in the maize genome and found that seven PLATZs interacted with both RPC53 and TFC1. Our findings indicate that ZmPLATZ proteins are generally involved in the modulation of RNAPIII-mediated small non-coding RNA transcription. Jiechen Wang and Chen Ji contributed equally to this work. We are grateful to Mr. Xiaoyan Gao, Mr. Zhiping Zhang, Miss. Jiqin Li, Miss. Yunxiao He and Mrs. Qiong Wang (Institute of Plant Physiology and Ecology, SIBS, CAS) for their technical support. This research was supported by the National Natural Science Foundation of China (91635303 to Y. W., 31871626 to J. C and 31671703 to Z. Z. ), Chinese Academy of Sciences (XDPB0401 and XDA08020107 to Y. W.), the Ministry of Science and Technology of China (2016YFD0100500) and a Chinese Thousand Talents Program Grant (to Y. W.). The datasets supporting the conclusions of this article are included within the article and its Additional files. The A619 seeds are available from the Maize Genetics Cooperation Stock Center (https://maizecoop.cropsci.uiuc.edu/request/). JW, CJ and YW designed the research, analyzed the data and wrote the manuscript. JW, CJ, QL and YZ performed the research. All authors have read and approved the manuscript.